Introduction: India is facing a dual burden of overweight/obesity and under nutrition among children less than 5 years of age. Neck circumference is recently studied marker for malnutrition among adults and older children. Objective: To correlate neck circumference with body mass index and to associate it with wasting and underweight status. Material & Methods: A cross sectional study was conducted among children less than 5 years of age attending the outpatient setup of a tertiary care setup in Nagpur, Maharashtra. Demographic details and anthropometric measurements were done for the children with necessary permission before the start of the study. Anthropometry was done using standard guidelines and WHO charts were used for classification of wasting and underweight Results: We included 260 study subjects in our study. The mean age of the children was 21.55 ± 17.31 months and majority of them were females, belonged to Hindu religion (58.07%), belonged to Class 4 (33.08%) and the mothers were educated up to senior secondary (34.62%). Neck circumference had significant positive correlation with birth weight (r=0.138) and body mass index (r=0.211). The average neck circumference was significantly lower in case of wasted (p<0.05) and underweight children (p<0.05). Conclusion: Neck circumference correlated significantly with body mass index and was significantly lower in wasted and underweight in children less than 5 years of age. Malnutrition is major public health concern. It is like a coin of which one facet is over nutrition and the other facet is under nutrition. Developing country like India is facing a dual burden of this disease which is affecting all age groups of the society among which children are one of the vulnerable groups. Adiposity or under nutrition in children will have serious effects in later life. Body mass index, weight for age and weight for height are most commonly used measures to quantify the malnutrition. But these represent the total body fat and hence do not give sufficient information regarding distribution of body fat. Upper body fat is known to have associations with increased cardiovascular risk in adults and children., Neck circumference measures the upper body fat and has been associated with obesity, hypertension, cardiovascular risk and metabolic syndrome in many studies done across the world.,,,, But very few studies have been conducted in this regard specially on children less than 5 years., So we conducted this study to find out the association between neck circumference and wasting and underweight and to correlate neck circumference with body mass index among the children attending under five clinics of our tertiary care setup. This cross sectional study was conducted in the under five clinics training centre (1 each in rural and urban health centre) of a tertiary care centre in Nagpur, Maharashtra. The children less than 5 years of age who attended the under five clinics between January 2017 to April 2017 have been included in this study. Children with pre-existing thyroid illness, chronic illness on treatment and with neck abnormalities were excluded from the study. Necessary permissions were taken from the ethics committee. An informed assent was taken from the parents before start of the study. Data collection was done by interviewing the mother/attending guardian using a case record which contained demographic variables and anthropometry. The demographic variables included were name, age, address, gender, religion, socio economic status, educational status of mother and birth weight. Religion was classified according to the categories of Indian census. Socio economic status was classified using BG Prasad classification based on the consumer price index of the study period. Anthropometry included height/length and weight were measured using standard guidelines., Further, body mass index was calculated using this data. Based on the World health organisation (WHO) charts for weight for height and weight for age it was classified in wasted, underweight respectively. Body mass index was calculated using the standard formula. Birth weight was categorised using the standard WHO guidelines into low birth weight and normal birth weight. Neck circumference was measured using a non stretchable tape at the level of most prominent portion of the neck, the thyroid cartilage. The child’s head was held erect with eyes forward and the neck in horizontal position. A pilot testing was done in 50 study subjects for finding the final sample size and to feasibility of variables used in the case record form. The case record form was finalised and data was collected by interviewing the mothers/guardians attending the children. The correlation coefficient of neck circumference with body mass index based on this pilot study was 0.182. Using this data and formula for sample size based on correlation coefficient, with 80% power and 5% absolute error we found the minimum sample size to be 235. The final sample size was achieved after adding up non response rate of 10% and further increased upto 260 study subjects. The data was collected, entered using EPI Info (version 7.2). The analysis was done using statistical package of social sciences (version 20.0). The qualitative data was expressed in terms of percentages and the quantitative data was represented using mean and standard deviation or categorised and expressed in terms of percentages. The difference between the two means was tested using student t-test. The correlation between the two continuous variables was done using Pearson’s correlation coefficient. All the p values were two tailed and significance level was set below 0.05. We included 260 study subjects in our study. From [Table 1], the mean age of the children was 21.55 ± 17.31 months. Majority of the children were females (51.54%), were delivered normally (53.08%) and 23.46 % were low birth weight. Majority of families belonged to Hindu religion (58.07%), belonged to Class 4 SES (33.08%) and the mothers were educated up to senior secondary (34.62%). [Table 2], showed the mean height, weight, neck circumference and body mass index was higher in females compared to males (p>0.05). 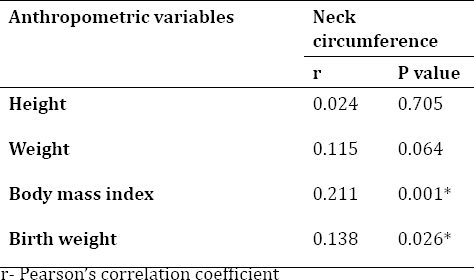 From [Table 3], neck circumference was positively correlated with birth weight (r=0.138) and body mass index (r=0.211). But, there was no significant correlation with weight and height of the children (p>0.05). From [Table 4], the mean neck circumference was significantly lower in children who were wasted when compared with normal children. (p<0.001) The neck circumference of the children who were overweight/obese had significantly higher neck circumference than those with normal children (p=0.04). From [Table 5], the mean neck circumference of the children who were underweight was significantly higher than those having normal weight for age (p<0.05). Two of the global nutrition targets set by World Health organisation to achieve by 2025 are to maintain and prevent childhood wasting to less than 5% and to achieve no increase in the childhood overweight and obesity status. Neck circumference is a novel anthropometric marker which has been studied to indicate malnutrition. We conducted a cross sectional study to correlate neck circumference with body mass index and to associate it with wasting and underweight status. The mean age of the study subjects was 21.55 ± 17.31 months with majority of them being females, belonging to Hindu religion, upper lower socio economic status, the mothers were educated upto secondary school and based on the birth weight of children 23.46% had low birth weight. Neck circumference had significant correlation with body mass index of the children (r=0.211; p<0.001). A study conducted by dos Santos et al in children between 13 to 24 months of age showed that there was a significant correlation between neck circumference and body mass index in both the genders. Similar findings were inferred by Yashoda HT et al (13 to 17 years), Hassan NE et al (7 to 12 years), Atef A et al (7 to 12 years), Kelishadi R et al (7 to 18 years), Hatipoglu N et al (6 to 18 years), Kim Y et al (7 to 13 years) and Rajagopalan A et al (6 to 18 years).,,,,,, Another study conducted by Kondolot M et al inferred that neck circumference maybe used as a marker to define obesity in preschool children. They further even reported the neck circumference percentiles to classify the same in Turkish preschool children. A systemic review and Meta analysis done by Ma C et al reported that neck circumference has moderate efficacy in indentifying overweight and obese children and adolescents (6 to 18 years). We also found that the neck circumference was significantly lower in case of wasted and underweight children when compared to normal children. One study conducted by Continho CA et al inferred similar results but the study was conducted in children of 6 to 17 years of age. Of all the above review conducted, our study was the first of its kind to correlate neck circumference with body mass index, wasting status and underweight status in this vulnerable age group. Further, we also correlated neck circumference with birth weight of the children and found a significant correlation with it. The results based on our study less generalizable since it was a hospital based cross sectional study and was a single centre study (One Urban and one rural health training centers of single tertiary care hospital). In the present study, neck circumference positively correlated with body mass index of the children less than 5 years of age. Further, the neck circumference was lower in underweight and wasted children when compared with the normal children indicating its importance in detecting the under nutrition of the children. The study gives a scope to conduct future studies with larger sample size and population based studies. Kolčić I. Double burden of malnutrition: A silent driver of double burden of disease in low-and middle-income countries. J Glob Health 2012;2(2):020303. Müller O, Krawinkel M. Malnutrition and health in developing countries. Can Med Assoc J 2005;173(3):279-86. Tzioumis E, Adair LS. Childhood dual burden of under-and overnutrition in low-and middle-income countries: a critical review. Food Nutr Bull 2014;35(2):230-43. Nuttall FQ. Body mass index: obesity, BMI, and health: a critical review. Nutr Today 2015;50(3):117. Jaksic VP, Grizelj D, Livun A, Boscic D, Ajduk M, Kusec R, et al. Neck adipose tissue-tying ties in metabolic disorders. Horm Mol Biol Clin Investig 2018;33(2). Lee JJ, Pedley A, Therkelsen KE, Hoffmann U, Massaro JM, Levy D, et al. Upper body subcutaneous fat is associated with cardiometabolic risk factors. Am J Med 2017;130(8):958-66. Niniya J, Patil CR, Bhatkule PR, Ughade SN, Narlawar UW. 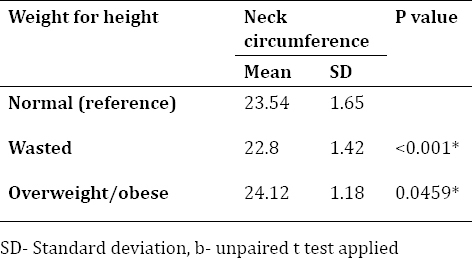 Neck circumference: a potential anthropometric marker for screening of hypertension in adult population of central India. Int J Community Med Public Heal 2016;3(12):3374-9. Patil CR, Deshmukh JS, Yadav S, Patil S, Sheikh AR. Neck circumference: A novel anthropometric tool for screening obesity in adults. Int J Collab Res Intern Med Public Heal 2017;9(7):711- 20. Patil CR, Deshmukh JS, Lalwani CR, Bagde H. Neck Circumference: An Alternative Tool for Screening Cardiovascular Risk among Adults. J Clin Diagnostic Res 2018;12(3):LC01-LC04. Ben-Noun L, Laor A. Relationship of neck circumference to cardiovascular risk factors. Obes Res 2003;11(2):226-31. Santos D dos, Contarato AAPF, Kroll C, Bertoli M, Czarnobay SA, Figueirêdo KBW, et al. Neck circumference as a complementary measure to identify excess body weight in children aged 13-24 months. Rev Paul Pediatr 2016;34(1):302-7. Kondolot M, Horoz D, Poyrazoglu S, Borlu A, Öztürk A, Kurtoglu S, et al. Neck Circumference to Assess Obesity in Preschool Children. J Clin Res Pediatr Endocrinol 2017;9(1):17-23. Singh T, Sharma S, Nagesh S. Socio-economic status scales updated for 2017. Int J Res Med Sci 2017;5(7):3264-7. Ben-Noun LL, Laor A. Relationship between changes in neck circumference and cardiovascular risk factors. Exp Clin Cardiol 2006;11(1):14. Hulley SB, CummingsSR, Browner WS, Grady D, Newman TB. Designing clinical research: an epidemiologic approach. 4th ed. Philadelphia, PA: Lippincott Williams & Wilkins; 2013. Appendix 6C, page 79. Yashoda HT, Swetha B, Goutham AS. Neck circumference measurement as a screening tool for obesity in children. Int J Contemp Pediatr 2017;4(2):426-30. Hassan NE, Atef A, El-Masry SA, Ibrahim A, Abu Shady MM, Al-Tohamy M, et al. Neck circumference as a predictor of adiposity among healthy and obese children. Maced J Med Sci 2015;3(4):558-62. Atef A, Ibrahim A, Hassan NE, Elmasry SA, Elashry GI. Neck circumference as a novel screening method for estimating fat distribution and metabolic complications in obese children. Egypt Pediatr Assoc Gaz 2015;63(3-4):91-7. Kelishadi R, Djalalinia S, Motlagh ME, Rahimi A, Bahreynian M, Arefirad T, et al. Association of neck circumference with general and abdominal obesity in children and adolescents: The weight disorders survey of the CASPIAN-IV study. BMJ Open 2016;6(9):e011794. Hatipoglu N, Mazicioglu MM, Kurtoglu S, Kendirci M. Neck circumference: An additional tool of screening overweight and obesity in childhood. Eur J Pediatr 2010;169(6):733-9. Kim Y, Lee J-M, Laurson K, Bai Y, Gaesser GA, Welk GJ. Accuracy of Neck Circumference in Classifying Overweight and Obese US Children.ISRN Obes 2014;2014:16. 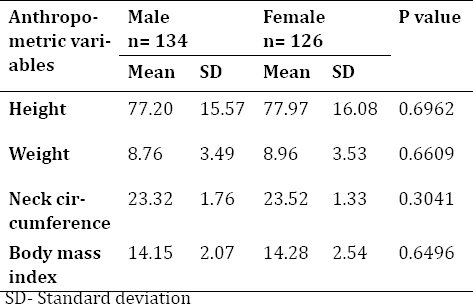 Ma C, Wang R, Liu Y, Lu Q, Liu X, Yin F. Diagnostic performance of neck circumference to identify overweight and obesity as defined by body mass index in children and adolescents: systematic review and meta-analysis. Ann Hum Biol 2017;44(3):223-9. Coutinho CA, Longui CA, Monte O, Conde W, Kochi C. Measurement of neck circumference and its correlation with body composition in a sample of students in Saõ Paulo, Brazil. Horm Res Paediatr 2014;82(3):179-86.